Crunchyroll has been providing its strong community with the latest and greatest in Japanese animation. Aside from their robust library growing with new shows and movies, Crunchyroll has always looked to give their fans more opportunities to enjoy anime outside of their streaming service. Today Crunchyroll has announced their partnership with Fathom Events to bring “Crunchyroll Movie Nights” in 2019. It’s a year-long event that will showcase the best that anime has to offer to cinemas across the country on select nights. To kick off the partnership, Crunchyroll and Fathom events will give its fans a theatrical premiere of Mob Psycho 100 II (season 2). The first Crunchyroll movie night will take place on January 5, 2019, starting at 12:55 pm local time. 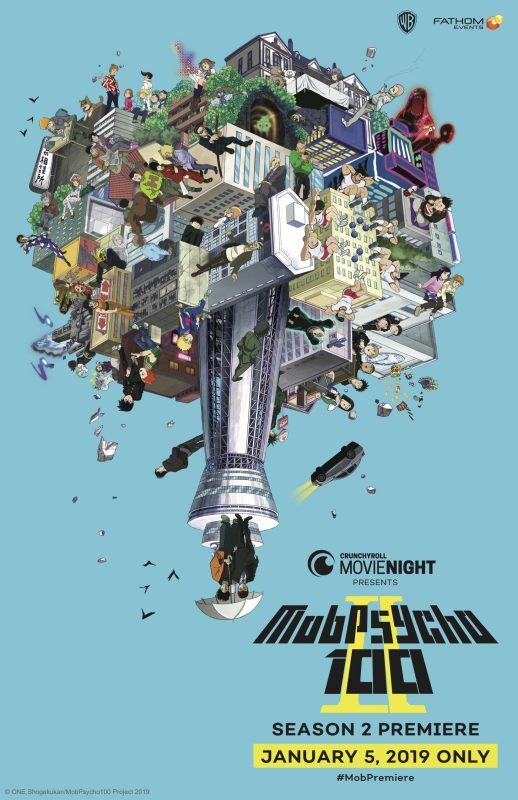 The screening of Mob Psycho 100 II will be accompanied by a special OVA episode titled “Mob Psycho 100 REIGEN The Miraculous Unknown Psychic.” Alongside the episode, attendees will see a special greeting from Setsuo Ito, the voice actor who plays the main character Shigeo Kageyama (Mob). Mob Psycho 100 Reigen The Miraculous Unknown Psychic is available now on Crunchyroll. Mob Psycho 100 follows a middle school student named Shigeo Kageyama, a kid who’s a powerful psychic. As Shigeo grows older, his powers become more powerful. To avoid his powers reaching dangerous levels, Shigeo tries to keep a mundane and boring life to suppress his emotional reactions, but as powerful forces begin to come after Shigeo, he begins to struggle to keep his psychic abilities from breaking its limit. Tickets for the event will be available on Fathomevents.com starting on Friday, December 7 with over 500 theaters nationwide participating. Subscribers of Crunchyroll will be able to purchase tickets early starting today December 5th and will continue to get presale access for future Movie Night Events. Mob Psycho 100 II will premiere on January 7, 2019, with simulcast streaming on Crunchyroll after episodes air in Japan. The post Crunchyroll and Fathom bring Mob Psycho 100 season 2 to theaters appeared first on Nerd Reactor.